"‘You are only here once’, and trips like these are a way to get out there and live your life to the fullest, get outside of your comfort zone and make the most of the life you have." Travel is an important part of my life. 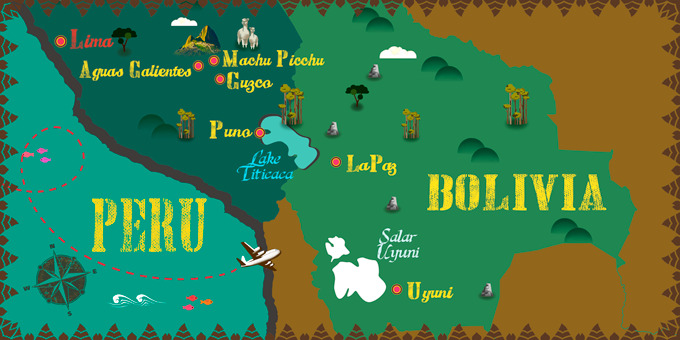 I’ve lived abroad in Spain for a number of years, travelled extensively around the world and also spent three months in South America in 2013, so when I saw this trip to Bolivia and Peru, I was excited to revisit the region. I receive a weekly offer newsletter from Travelzoo and saw the Exoticca tour on there. Although I’d been to both Peru and Bolivia before, I hadn’t made it to Machu Picchu on my previous trip, due to ongoing strikes in the country which made visiting the ancient Inca site impossible. My friend Nina, who I’d met ten years ago, on a walking tour holiday in Halkidiki, fancied the trip too, so we booked up together and began to look forward to exploring the many iconic sights in two of South America’s most enchanting countries. I was also excited to put my Spanish into practice! We touched down in La Paz, the highest capital city in the world and a sprawling metropolis which sits in the Andes Altiplano plateau and extends up into the mountains surrounding it. It struck me just how busy and lively the city was and the traffic was constant. The cable car system in La Paz is simply awesome; like a metro in the sky! It links the downtown area to the hills and it's also a fantastic way to get the best views across the city. The city is at an impressive 3,500 metres above sea-level, so the altitude can be quite noticeable when you first arrive, but we made sure to drink lots of the ‘coca tea’, the remedy favoured by locals, as well as visiting the pharmacy for tablets to help us acclimatise. On arrival, we were met by the tour representative and throughout the trip had a fantastic experience with the guides. We had the guides to ourselves the whole trip, so we were able to learn a lot about the places we were visiting and had their undivided care and attention, which really added to the experience. All of our pickups were prompt and I found the itinerary to be well-organised; the tour ran smoothly and to plan. 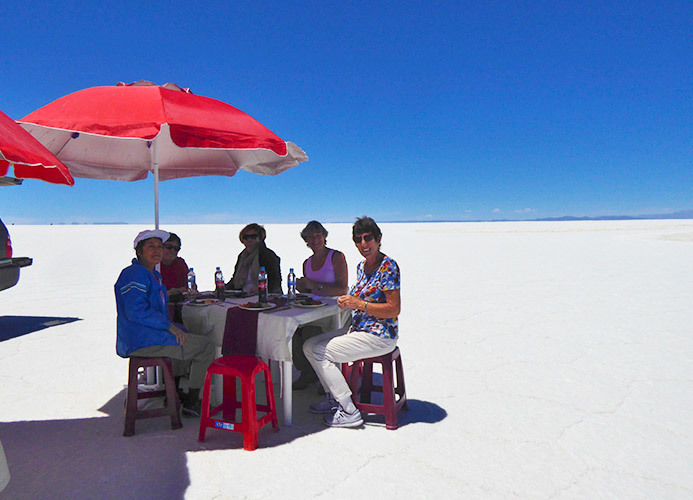 One of the things that stood out to me about this trip was that it included excursions to the Uyuni Salt Flats, an incredible and unique natural landscape that stretches for hundreds of kilometres in the southwest of the country. The miles and miles of salty, rocky terrain is the legacy of a dried-up prehistoric lake and I thought it would be an amazing place to visit. We took a short flight from La Paz to Uyuni, a very rustic town with an ‘old country’ kind of atmosphere, although I found it to be quite quaint. The roads were basic and we felt like we had stepped back in time. The next day we headed out across the salt lake and travelled further and further into the otherworldly landscape. Buildings and cars became few and far between until eventually, we couldn’t see another soul for miles around! We had a picnic out on the salt lake, taking in the strange landscape around us. It was a unique and extraordinary experience; I loved it! We also visited a dormant volcano where there were tiny communities dotted around the border of the lake. I couldn’t believe people lived so far removed from amenities and at the mercy of the harsh climate. They were very isolated but had solar panels and access to electricity. It was eye-opening to consider what life might be like living somewhere like Uyuni. From Uyuni, we headed back to La Paz before transferring by road across the border and into Peru, and to Puno. 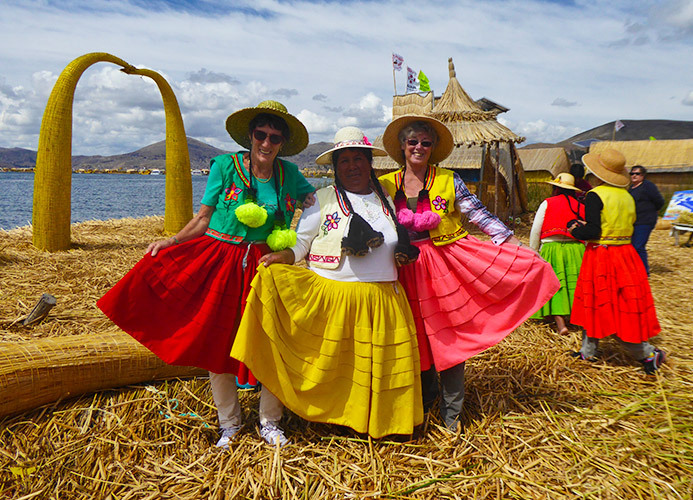 I had visited Puno and Lake Titicaca before, but had only visited one of the islands, so I was looking forward to the excursions on the lake and learning more about the people who call it home. Our hotel was lovely, overlooking the lake and it felt peaceful compared to busy La Paz. 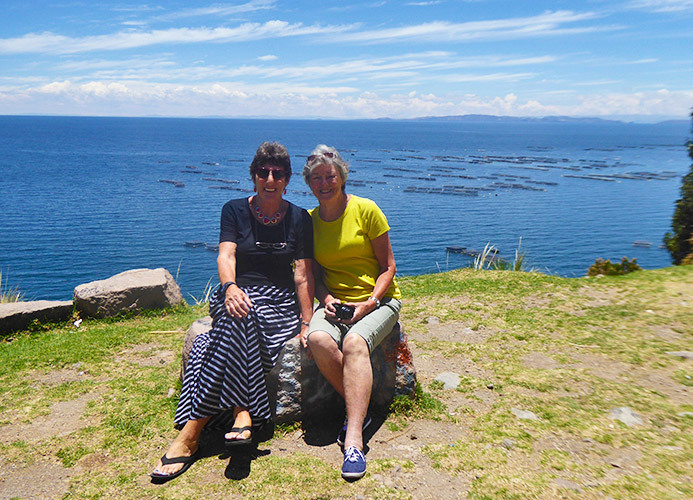 Our excursions the next day took us out onto the islands of Taquile and Uros on Lake Titicaca, where local communities live and work, floating on the highest lake in the world. I really enjoyed the insight into local life and the sheer size of the lake is unbelievable. We still had the highlight of the trip to look forward to, which was our much-anticipated visit to Machu Picchu, so from Puno, we headed to Cuzco. Cuzco is the heart of the Inca empire and a place that I had fond memories of from my previous visit years before. Unfortunately, we didn’t have much time to sightsee here, as from Cuzco we took the Expedition Train up towards Aguas Calientes, the gateway to Machu Picchu. Nothing quite prepares you for experiencing such a wonder of the world with your own eyes. We’ve all seen plenty of photos of Machu Picchu, but the detail and the sheer size of it is something a camera lens could never capture. I had a lump in my throat looking out over the ancient site. I tried to comprehend what life might have been like during the days of Inca civilisation and found it simply amazing how people used to live, work, worship, grow crops and rear animals up in these mountains. It is a very well preserved site; you can tell it is respected and looked after. Although we didn’t see them, we found out that they usually have llamas grazing on the grass on the different levels to keep the ruins from becoming overgrown, which I thought was a great idea! Our guide at Machu Picchu, Marco, was brilliant and truly brought the history of the place to life. You could tell he loved his job and wanted to share his enthusiasm and knowledge with us. We were also quite lucky with the weather as it was sunny and bright for most of the day, although just before we left the sky grew dark and the heavens opened and we needed to put our ponchos on! Despite the rain, seeing Machu Picchu with the moody sky as a backdrop only added to the experience. It was an amazing day which I will never forget. The hotels were good throughout our trip with comfortable rooms, friendly staff and they were mostly well placed for exploring in our free time. A great way to experience the culture when you’re away is to eat the local food, and I’ve always been quite adventurous! I loved the South American food and even tried a dish with llama meat in. It was delicious, although I didn’t fancy trying guinea pig, another Peruvian delicacy. I have a philosophy that I follow in life: ‘You are only here once’, and trips like these are a way to get out there and live your life to the fullest, get outside of your comfort zone and make the most of the life you have. It was great value for money, so I would definitely recommend getting out into the world and experiencing some of these wonderful sights if you can afford to do so. I’ve got lots more travel planned, including a Panama Canal Cruise and maybe even Japan in the future. 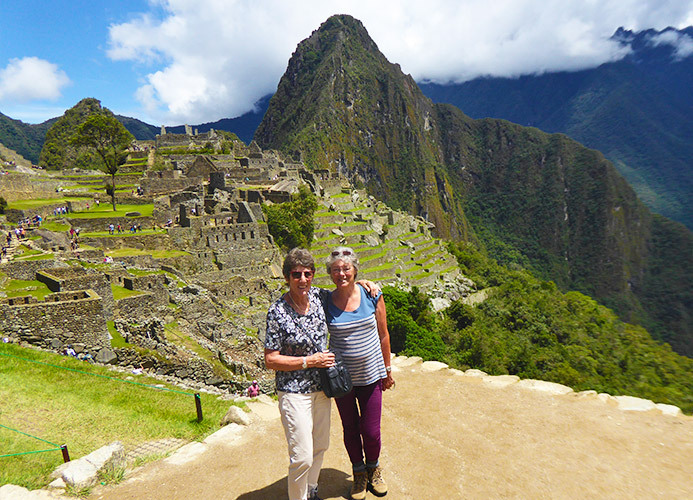 South America is a wonderful place full of culture and history and I’m glad my friend, Nina, and I, were able to share the experience together and tick Machu Picchu off of our lists! Perfect for the unpredictable weather, they are great at keeping everything dry as you can wear your bag underneath them. Similar to the well known ‘Coca Tea’ but without the stimulating side effects, so perfect for drinking at bedtime to help you sleep at altitude. If you struggle with the altitude, you can visit a local pharmacy who have plenty of medicines to help you acclimatise quicker and make the most of your trip.